Hydraulic line hauler, baiting machine and baitcutter. The hydraulic line hauler controls both the setting of the longlines and the hauling of the longlines. 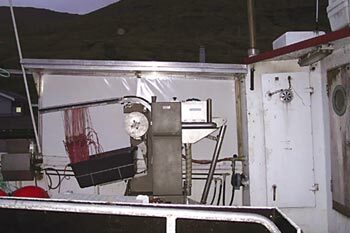 The bait cutter chops the bait in small pieces and then the bait is put in the baiting machine. The line then runs from the baitcutter through the baiting machine into the ocean. The longline system is easy to handle and very functionel. We have delivered systems to South Africa, Belgium, Farrow Islands, Poland and Greenland, among others. diamètres de 2,5 à 6,0 mm.